They're spooky, scary and all a little bit frightening. 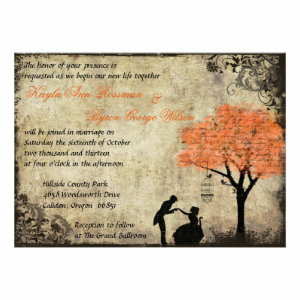 Our latest Halloween Wedding Invitations are perfect for couples looking to tie the knot around the Halloween season. 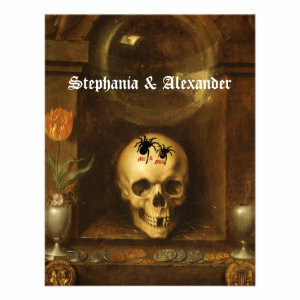 With lots of Halloween related images like Jack o'Lantern pumpkins, skulls, spiders and bats, there's Gothic designs, vintage Halloween designs and modern Halloween stationery. Enough for even the most avid Halloween fan. Halloween is becoming a very popular time of year to get married. Many couples have themed weddings featuring lots of Halloween decorations, wedding stationery and spooky Halloween related food. Some couples even dress up in Halloween fancy dress trick or treat costumes. You could either wear your favourite costume or have a theme like vampire and ghosts or scary horror movie characters. With more and more couples opting for non traditional weddings there has been a surge of quite inventive and fun wedding theme ideas. Themed weddings are a great idea for couple who want to have a wedding with a bit of a difference. 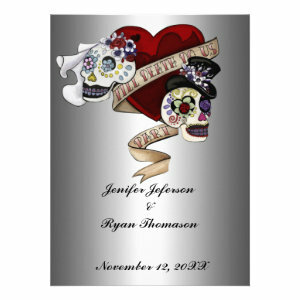 All of the Halloween Wedding Invitations are customizable so you can personalize them just how you want. Change the text to include guests names, wedding details, venue, and any other relevant party details. You can change the font, styles, design and colour. There are also several different paper option from standard, high gloss, and extremely high quality canvas or papyrus blends. We aim for our invitations to accentuate your existing ideas or plans and sit perfectly with your ideal wedding. 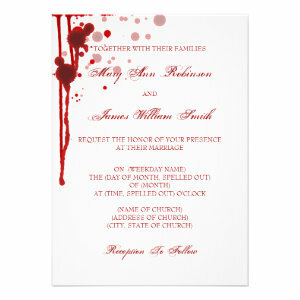 Get your creepy Halloween wedding of to a frightening good start with our customizable Halloween Wedding Invitations.